Usually when I think about green salads I think about a summer day and a light, refreshing meal. Funny that when I was looking over my files this morning and saw this mixed green salad with an easy raspberry dressing made from seedless raspberry jam, that all I could think about is how wonderful it would be for a New Year's Day meal. 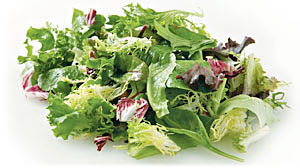 The salad greens are important so don't chop up Ice Berg lettuce or even just romaine. Use a nice, pretty mixture. Sometimes I look into my recipe files and wonder why I clipped or copied down a particular recipe. I don't save recipes that I don't really want and don't think I'll actually make at some point, so when I saw one for Crema d'Ananas I filed away in my collection from Pleasures of Italian Cooking, I knew I had to have had a reason at the time. 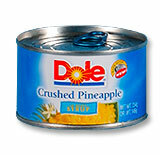 The problem is that it called for canned crushed pineapple, which I don't care for and won't eat. After I looked at the ingredients and prep I realized that I saved it because I was going to 'play with my food' a bit. Remember, for me, recipes are just a guide, but I never actually follow them! This one is one of those. It looks like a beautiful and simple dessert, but since I don't like canned pineapple I would replace it with raspberries or perhaps even leave out the fruit and top it off with fresh sliced strawberries on top. Beat yolks and sugar in top of double boiler. Place over hot water and cook, stirring constantly, till thick and frothy. Remove from heat and stir in cognac to taste. Chill 2 hours. Whip cream and fold in with pineapple. Spoon into 8-10 sherbet or parfait dishes. Chill 2 hours. 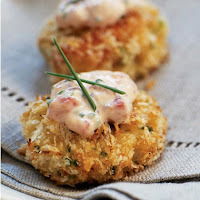 Mmmm Crab Cakes. This one is from Sunset Magazine back in January of 2002. Mini, so it makes them the perfect appetizer but in our house we'd make them a bit bigger and serve them as dinner. Yesterday as I left work I checked in with the members of our busy family and found out only one child would be home at dinner time and she had just ate a late lunch/early dinner with friends so she wasn't hungry. My last call was to my husband to find out what his work schedule was and when he would be home. Typically home between 9:00 - 11:30 pm, I was surprised to find out he was going to be home by 7:30 pm - which is a very strange time. My confusion was quickly solved when I told him I was deciding what to make for dinner as it was just him and I. "Good! Make football food because there's a game on!" No wonder he switched shifts and got off work early. A big NFL game for his team played last night. Football food in our house means appetizers, finger foods and nacho dips. Things he and the kids love and request during every game. 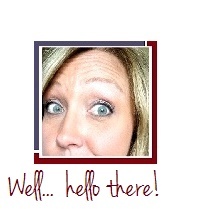 My appetizers, foods and dips change often depending on my mood and what's on hand. I currently had Hormel Chili on hand as I bought 3 cans to use in a nacho style dip for Christmas Eve Day in the crock pot but we had so much food already I didn't make it. Bingo! Perfect hot food for my husband during the game. As a child I only loved green or yellow apples... not red. I remember for a span of about 3 months, I would walk to the local 'mom and pop' shop on the corner about 6 blocks from my home every afternoon and I would purchase a Fresca and one yellow delicious apple. Later CapriSun came out with their first 'pouch' drink, sold in the freezer section and only in lemon so I switched to 1 CapriSun and 1 yellow apple. I would eat them on my way home. When it came to green apples, that was my family's favorite. My brothers and I would cut up a few green apples, place them in a bowl of salt water and munch to our hearts content. The more salt the better. One thing we never, ever did was get into 'fruit dips'. Eating something sweet and sticky like caramel on our apples was just... weird. It was only after I moved out at 18 that I realized many other people loved sweet fruit dips for their apples - my husband included. When I make a fruit dip for my family it's usually a simple caramel dip. They don't seem to care for honey or strawberry or other flavors with their apples. Here is a simple fruit dip that only involves two ingredients. How can it get any easier? Soften the caramel dip in microwave but only for about 15-20 seconds. You don't want it hot, just soft enough to stir easily. Stir the caramel into the Cool Whip. Chill in the refrigerator until ready to serve with sliced apples. If you bought blue cheese for the holidays and need a recipe to 'use it up' on, how about a cheese log for New Year's? This one is from Southern Living back in March of 2004. If you have cheddar and blue cheese on hand as well as some leftover pecans from your holiday baking and perhaps some Worcestershire sauce in the cupboard, give it a go. 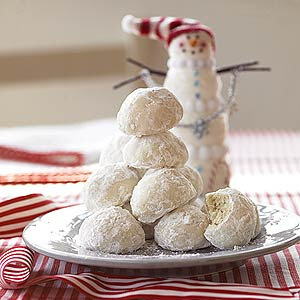 You can make it today and freeze it or refrigerate it until New Year's. Process cream cheese, cheddar cheese, blue cheese, onion, worcestershire sauce and 1 cup of the pecans in a food processor 1 to 2 minutes until combined, stopping to scrape down sides. Stir together cheese mixture, 1 cup pecans, and 1/2 cup parsley. Cover and chill 1 hour. Shape cheese mixture into 4 (7-inch) logs. Combine remaining 1 cup pecans and 1 1/2 cups parsley. Roll logs in parsley mixture; cover and chill until ready to serve. Serve with crackers. It's Christmas Eve morning and I took the day off from work as it's a 'family' day for us. A day of board games, food, crafts, movies and Scandinavian and German traditions all rolled together into making memories. This morning I glanced through some of my files to see what I had anticipated having time to post and/or make but didn't get to yet (thanks to that 'other' job I have where I report to an office each day!). I found White Trash in my files and since it's a hugely popular recipe to make during the holidays I knew I had better post it asap! A mixture of cereals, peanuts and candy all covered in the wonderful goodness of vanilla almond bark or white vanilla chips, it's a perfect mixture of salty and sweet and will be gobbled up by the handfuls! Hugely popular, don't be surprised if you find yourself making 2 or 3 batches of this! 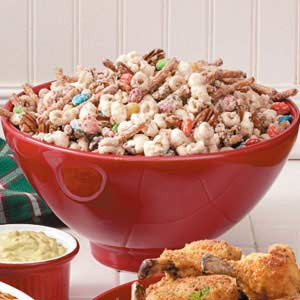 Place the pretzels, cereals, peanuts and candy in a large bowl. Microwave the chips/almond bark and oil until melted. Stir the mixture until creamy and smooth. Pour over the dry ingredients and mix well. Spread on wax paper covered counter. Cool and break apart. Store in a sealed container. This dessert came to my files from Pillsbury and works great for an office party or pot-luck so you can make it the night before, finish it in the morning and chill it in the office refrigerator until it's break time at lunch. The meringue sits in the oven to finish baking and 'drying' so the process can happen while you are sleeping! Beat whites, cream of tartar and salt. Add sugar gradually 2 tablespoons at a time. Beat to stiff peaks and glossy. Spread in greased 9x13 pan. Put in 450º oven. Turn oven off and keep closed several hours or overnight. Beat cheese and syrup. Beat cream. Fold in chocolate mixture and marshmallows. Spread over cold meringue. Sprinkle with almonds. Refrigerate at least 4 hours. Cut squares to serve; drizzle with 1 teaspoon chocolate syrup. This does not store well as it will weep so it's best to make for a crowd, not just one or two people. Unfortunately I didn't get to make everything on my list before the calendar rushed ahead and a couple deadlines loomed but yesterday I got the baked goods delivered to about 8 neighbors (along with a 'Thank You' for helping us dig out of the blizzard a couple weeks ago!) and 3 goody trays are made for my husbands place of work, ready to be delivered tomorrow. 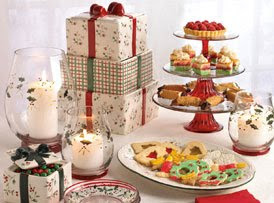 Of course I saved extra for a few other gifts, a large tray for our own family celebrations, some to share, etc. Even without making all 27 items on my list I had more than enough to go around. I still have to make "People Puppy Chow" for my 17 year old son but other than that my baking for 2009 is done. How about you? Did you fare well? When the wind is blowing outside and the snow is flying, my body seems to crave hot creamy soups, casseroles and comfort foods. On a warm summer day in June I think shrimp on the grill with a side of fresh fruit is mouth watering. But blueberry muffins? I feel like these are a year-round food that goes well on a summer or a winter morning. While doing the no-sugar, no-white flour detox I was on the hunt for delicious sounding recipes and saved a handful to my collection to use in the future. This is one I hadn't tried yet but want to keep in my collection for future use. I'm following it up with a very typical, regular blueberry muffin recipe for my readers that aren't looking for a low carb or soy option. Preheat oven to 375°F. Mix Rice bran with 3 tablespoons soy flour. Set aside. Spray a 12-cup muffin tin with vegetable oil cooking spray. Evenly sprinkle the inside of the muffin cups with the rice bran and soy flour mix. In a bowl, whisk all the remaining ingredients, except the blueberries. Fold in the blueberries and fill the 12 muffins cups evenly with the batter. Place on the center rack of the oven and bake for 20 to 25 minutes, or until the tops turn golden brown and a toothpick stuck in the center comes out clean. Let cool completely before storing in the refrigerator. Preheat oven to 400 degrees F (200 degrees C). Grease muffin tins or line with muffin liners. Mix together the crumb topping ingredients; 1/2 cup sugar, 1/3 cup flour, 1/4 cup butter, and 1 1/2 teaspoons cinnamon. Blend and set aside. Combine 1 1/2 cups flour, 3/4 cup sugar, salt and baking powder. Place oil into a 1 cup measuring cup; add the egg and enough milk to fill the cup. Mix this with flour mixture. Fold in blueberries. Fill muffin cups to the top, and sprinkle with crumb topping mixture. Sprinkle the reserved topping over muffins and bake for 20 to 25 minutes until the center is done and the tops are golden. This Christmas Eve day will be celebrated by my family by spending the day together playing board games, watching Christmas movies and enjoying food... lots of food! Two of the foods I'm most excited about are not even main dish items. They are appetizers! One of them is a recipe that your Great-Great Grandma probably made and your Grandma and your Mother as well. Chipped Beef Cheese Ball. It's been around forever but it's oh-so-good. I like it with Ritz crackers, which is odd because I don't typically like a Ritz cracker as a dip-cracker with anything. This however, goes perfectly. Mix together and shape into a ball. Let stand in refrigerator 6-8 hours. When I was a full time Mom and housewife with small children, I would spread my holiday baking out over the course of a month, starting at Thanksgiving and baking up to the week of Christmas. I averaged about 14-19 different recipes, sometimes making 2-3 batches of the more popular items. So how is it that when I'm working outside the house full time at the office as well as working part time doing freelance at home, and trying to keep up with the crazy-busy schedules of our teens, that my list of holiday baking has grown from 19, to 27 items? As new recipes are tried and deemed a 'keeper' by my family the list grows... and all of the recipes are so good that we don't want to cut any of them out! This week is the first of my mini-deadlines for baking and candy making. Although I won't do the holiday trays for my husbands workplace until next weekend, as well as the neighborhood goodies, I have a fund-raiser bake sale tomorrow so this weekend was crunch time at getting a few of the items made from my list. I think I'm up to about 9. The snowflake cookies are decorated and ready to go, which is a three day task with my full time job. I make the dough on one day, cut and bake them other and frost the third. Sunday was my 'frosting' day and they are packaged and ready to be added to the trays along with the green tree's and yellow stars. Candy coated pretzels and almond truffles were also made last night... looks like I'm getting there, slowly but surely!! Serve your family strawberry shortcake tonight... using Grands Biscuits instead of shortcake! Not quite as wonderful as a homemade pound cake base, homemade sweet biscuit or a homemade sponge cake, but it's quick and easy and tastes pretty good. Best of all it takes just minutes! You can have dessert made in minutes. Open the can of biscuits, separate. Holding the biscuit in your fingers, dip just one flat, round side into the melted butter and then into the sugar. Place sugar side up on a baking sheet. Repeat. Bake as directed on the package and top with strawberries and fresh whipped cream. Although I thought I'd be up to my elbows in Christmas baking this morning I've found myself running errands and cleaning and organizing instead. The eggs, mixing bowl and frosting tips are sitting on the counter waiting for me. I got so preoccupied with household cleaning that I decided to check emails and take a little break before embarking on the afternoon of baking. First on my list is the Striped Cookie Rolls that I posted yesterday but I also want to get the dry Molasses Cookie Mix together and bagged so that later this week on an evening after work, I can throw together one or two batches of this delicious Christmas cookie and get a couple made and froze for party platters later. Having doughs and mixes pre-made and ready is a blessing when I find myself with 40 minutes free at 9:00 pm. 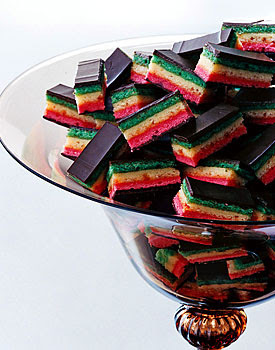 A couple years ago I was surfing the internet when I saw a photo of a striped bar cookie that caught my attention and I was smitten. I had to make them! Unfortunately there was no recipe with it - it was just a photo used in an article. I saved the picture to my files in the hopes of someday finding out what they were and making them. 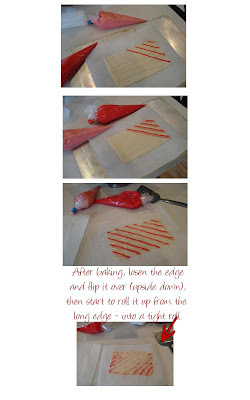 Last year while surfing the internet I stumbled up on the photo again, only this time I saw the recipe! I copied it down to my files to match up with the picture. Only... I forgot about them. This morning I laughed out loud. 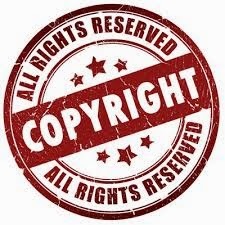 It seems this elusive recipe is now gaining popularity because I'm starting to see it - and the same stock photo - all over! Many websites now have both the cookie and the recipe listed. It has spurred me to add it to my holiday baking list. Here it is... the cookie that captured my attention a couple years ago. It's known by many different names.